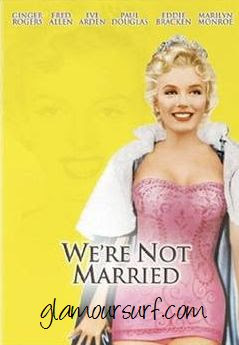 Marilyn Monroe starred in the film "Were Not Married' in 1952. A comic anthology about an elderly judge who discovers some of the marriage ceremonies he performed were not valid. Among the couples involved: new parents David Wayne and beauty queen Marilyn Monroe; bickering radio stars Ginger Rogers and Fred Allen; millionaire Louis Calhern and sneaky wife Zsa Zsa Gabor; soldier Eddie Bracken and pregnant spouse Mitzi Gaynor; and Eve Arden and Paul Douglas, who's considering adultery. Here is a photo of her in a gorgeous swimsuit no doubt in a casting call for this role. Isn't she gorgeous? Yes her AND the swimsuit! I haven't watched the film yet, but have just put in in my Netflix cue. Have you seen it?